"Slayer." You read it in the announcer's voice, didn't you? It's a mode all Halo veterans are familiar with. It's a mode that has seen your most vicious killing sprees and caused your most tempered tantrums. And it's a mode in the upcoming Halo 4's multiplayer, known as War Games. Since Bungie is no longer working on the series, passing the torch over to 343 Industries, I imagine there's some curiosity afloat as to just how addicted to rounds of multiplayer this next title will get you. Tuesday night's Halo 4 multiplayer event showcased the two announced multiplayer modes. I jumped into War Games for four versus four Slayering. Adjusting my load-out (I'm a DMR + assault rifle + plasma grenade kinda girl) let me choose between a set of new armor abilities that act like bonuses on a timed cooldown. If you played Halo: Reach, you're familiar with the concept. Halo 4 introduces Promethean Vision for seeing enemies through walls, Thruster Pack for a horizontal burst movement, Hardlight Shield for a hefty defensive shield, and Hologram (which is the one that isn't discernibly new at all, visual or otherwise). Promethean Vision, though it slows you down just after use, was the most useful new addition. The map we played on—placed on the combat deck of the UNSC Infinity—had platforms with gaps to surprise drop in on enemies. 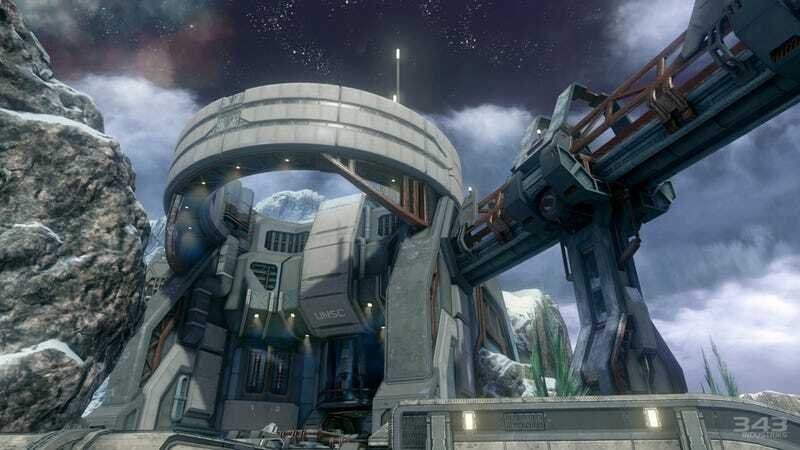 It also had energy beams to project you onto higher levels, a well-known transportation mechanism in the Halo franchise. Once I got the hang of the geography of the map, I engaged fluid killing mode. My team wrecked the opposing team (I had 10 kills, 13 assists thanks to my tailgating friend, and 2 deaths). We absolutely slaughtered them. It was remarkably fun (maybe a little bit due to our overwhelming victory). With a mounting kill streak comes Ordinance drops, providing me with all sorts of goodies. The energy sword is my favorite. There are speed boosts, the new Scattershot Promethean weapon, a sticky grenade launcher with an activation command, and more. It keeps the pace going, and before I know it it feels like the Halo multiplayer games I've been playing for forever. I almost forgot I was playing a new title. Almost. Besides the musical score, 343 also revamped the weapon and sound effect audio. If you listen closely, which it was hard not to do with a quality headset at our demo stations, you can hear clearer, more impressive, more robust bursts of ammunition. It makes each kill all the more satisfying and gleeful. Halo 4 was fun because it felt like, well, Halo. This is how I summed it up when talking with fellow journalists at the event: "For most people, it's just going to be another Halo game. But for Halo fans, it's exciting that we're getting 'just' another Halo game." I'm one such Halo fan. And while the experience wasn't drastically different from those hours I've poured into the campaigns and multiplayer rounds in years past, it was exactly what I needed to find myself smirking throughout the entire round. Halo 4's War Games mode will launch on November 6th, with the game, with 10 maps.